The Stormont Executive has overhauled local government in Northern Ireland for the first time since the 1970s, reducing the number of councils from 26 to 11. But how does life compare across the new boundaries? In the first Detail Data project, using data analysis to examine key social issues, Cormac Campbell reports on the major challenges facing communities. PEOPLE living in Northern Ireland’s new council areas are shown to be living radically different lives after data research revealed major disparities across a range of areas including education, health, employment, access to services and even life expectancy. Our examination of 11 sets of data for each of the 11 new councils allows the public to gauge the quality of life in their areas compared with other communities. 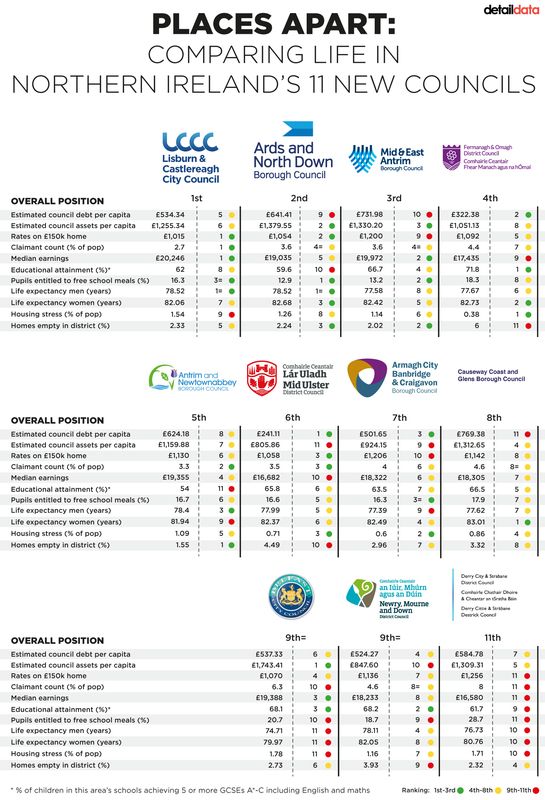 The analysis - which ranks the councils from 1-to-11 across each of the areas of life covered by the research - also exposes how communities that have been disadvantaged for generations continue to fall to the bottom of the league table despite nearly a decade of devolved government at Stormont. Groups operating at grassroots level across Northern Ireland speak out about their experiences working with deprived families and with communities denied easy access to services. • The 11 new councils have inherited debt totalling more than £1billion, equivalent to nearly £550 for every person living in Northern Ireland. • There is a difference of nearly 25% between the rates bills of similarly priced homes in different districts. • Derry & Strabane council area is at the bottom of the table, with the highest rates, the highest unemployment (8%), highest free school meal entitlement, the highest levels of housing stress, plus lower levels of life expectancy. • Many other councils show poor results, including in Belfast where poverty and overcrowding in deprived areas is blamed for low life expectancy and high levels of housing stress. • Antrim & Newtownabbey council area has the lowest level of educational attainment with just 54% of pupils achieving five or more GCSEs (A* to C) including English and maths. 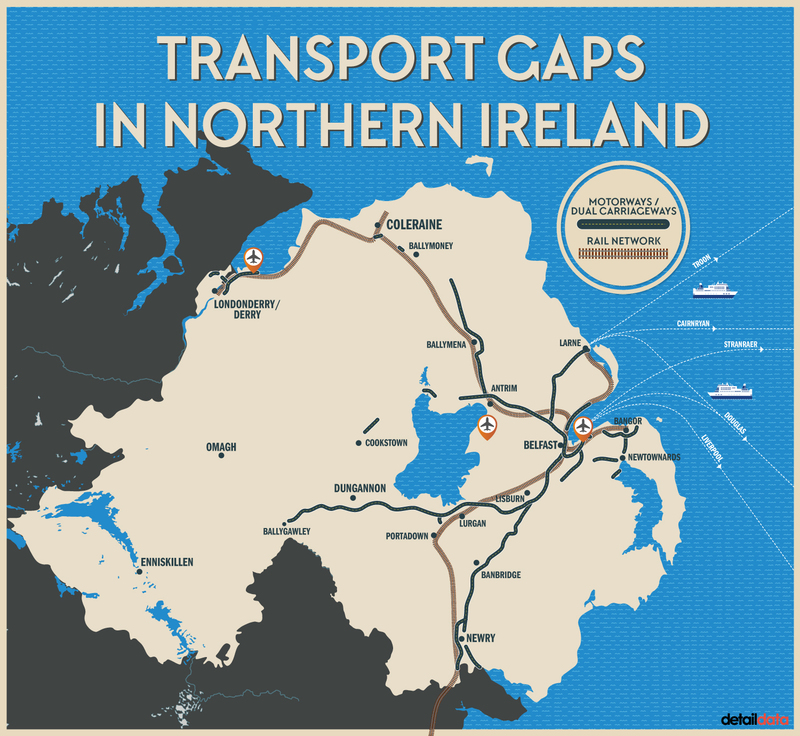 • We also map the gaps in transport infrastructure in Northern Ireland, illustrating poor provisions in an area running from Derry & Strabane, through Fermanagh & Omagh, to Newry/Mourne & Down. HOW CAN COMMUNITIES LOBBY FOR CHANGE? Professor Colin Knox, who specialises in Comparative Public Policy at Ulster University, said the Detail Data investigation sets a benchmark from which the future performance of the new local authorities can be judged. And he urged councils to “seize the moment” and seek to tackle the disparities using the new ‘community planning’ mechanism. Community planning will see councils work with government departments, statutory bodies and other agencies to develop measures to improve the economic, social and environmental wellbeing of a council area. Professor Knox said: “This Detail Data report is very useful in terms of highlighting, at the macro level, some of the major discrepancies. "This can act in the future as a benchmark to prompt local authorities to improve the way in which they deliver some services." He added: “My concern would be that some councils could be so overtaken or obsessed by the structural reconfiguration and where everybody fits into that, [they] will take their eye off the ball in terms of opportunities that might exist for community planning. Although concerns were identified in each of the 11 local government areas, the contrast between the highest and lowest ranked councils was particularly striking. Topping the table was Lisburn & Castlereagh Council, an area which has the lowest rates, the lowest levels of unemployment, the highest median earnings and the joint highest male life expectancy. At the bottom was Derry & Strabane, which scored poorly on virtually every one of our 11 measures. The district has the highest rates, worst unemployment levels and highest free school meal entitlement, as well as the lowest median earnings. It also received low scores for educational attainment and life expectancy for men and women. According to Danny O’Hagan of Strabane Community Project, the Detail Data findings highlight issues that are all too familiar to people on the ground. “High unemployment is not new,” he said. “If you go back to 1960, it was there, and it still is. “Strabane has always practically been the highest, but when you add Strabane and Derry together, you probably have the most deprived council of the 11. Fifteen miles away in Derry, Kenny McAdams of the city’s Resource Centre believes that despite its difficulties, the new district has been quick off the mark in terms of taking advantage of its new community planning responsibilities, with work beginning during the last years of the old council. “In Derry, the old council and Ilex took great initiative to set up a process of developing the One Plan for the city and that involved thousands of people,” he said. For Eamonn McCann, a spokesperson for both Into The West and the University For Derry campaigns, transport and education issues should rank highly on the new district’s priority list. “The railway issue and the university issue in particular, are associated in the minds of people in Derry with the broad general denial to Derry of equal treatment,” he said. “And that's what makes an issue like the railway, which might seem somewhat marginal from the outside, actually central in Derry. “We have got very low levels of educational attainment compared to other places. That's not because youngsters in Derry are stupid or are less bright than people in the rest of Northern Ireland. At the other end of the table, residents of Lisburn and Castlereagh have access to good roads, earn more, have lower rates, are less likely to be unemployed and live longer, but John Belshaw of Lisburn Citizens Advice Bureau insists that many of the district’s residents still face serious problems. “From the figures it looks well on paper but the people we see coming through the door certainly wouldn’t fit in to these high scores,” he said. Last year, we had a total of 7,800 contacts in Lisburn and we dealt with over 8,000 benefit issues and about 1,800 debt issues. Antrim & Newtownabbey, Ards & North Down, Armagh, Banbridge & Craigavon, Belfast, Causeway Coast & Glens, Derry & Strabane, Fermanagh & Omagh, Lisburn & Castlereagh, Mid & East Antrim, Mid Ulster, Newry, Mourne & Down. IS TRANSPORT POLICY A ROADBLOCK TO PROSPERITY? From high quality roads, rail, ports and airports to hospitals and university places, infastructure or the lack of it has been repeatedly referenced by contributors in terms of explaining some of the regional disparities highlighted in the Detail Data report. We couldn’t measure or rate infrastructure in each area on our scale, but given the strong views of some of communities in relation to it, it is clearly an issue of considerable concern. The map shown above illustrates the gaps in major transport infastructure. The past decade has seen improvements to the Westlink in Belfast, the A1 Belfast-Newry route, the upgrading of the A4 from Dungannon to Ballygawley and the completion of the A8 dual carriageway to Larne. But as our map above shows, the vast majority of high quality road and rail links are grouped in and around the greater Belfast area before fizzling out. According Wesley Johnston, an expert on Northern Ireland’s road network, current policy means the absence of dual carriageways and motorways in the west is unlikely to be addressed any time soon. “Until the early 90s we were following a road building policy called ‘predict and provide’ which meant that you upgraded roads if you thought the traffic levels were going to justify it in the future,” he said. “But for the past 20 years we have been following a reactionary road building policy where we don’t build new cross country routes. All we do is that we have identified a strategic road network and we try and alleviate bottlenecks on that. “What has tended to happen is that dual carriageways will be built on the busiest routes, where traffic levels justify them the most and that tends to be in mass population areas,” he said. “It is difficult, using cost benefit analysis, to argue for dual carriageways for ideological reasons - like to open up an area with high unemployment. “Things like the A1 and Westlink were prioritised because of high traffic levels on those roads and safety problems. Eamonn McCann, a spokesperson for the Into the West rail lobby group, believes under-investment in the north-west’s infrastructure underpins some of the region’s other problems. “We had a series of decisions made in the 1960s which operated detrimentally to the development of Derry,” he said. As a starting point to addressing some of these issues, on June 2, Regional Development Minister Danny Kennedy announced that work would soon begin on a £46million scheme to upgrade the railway line between Derry and Coleraine. Even in council areas that appear well served by motorway and dual carriageway provisions, concerns have been raised about connectivity. For example, in the new Mid Ulster council area – which is topped and tailed by Magherafelt (near the M2) and Dungannon (M1) - there are major difficulties. Further west and Mary T Conway of Omagh Forum for Rural Associations, states that the collapse of plans to upgrade the 55 mile A5 route from Derry to Aughnacoloy are just one of the transport problems. She added: “You can get frustrated and lobby and do all the rest – but it takes so long. “You can talk about the A5, but there are other things as well. The data used in this project was sourced from: the Department of Finance and Personnel; the Department of Education; the Housing Executive; NI Statistics and Research Agency; the Department of Environment; and the Department of Enterprise, Trade and Investment. To read more about the Detail Data project, click here. For information on NICVA's data training and events, click here.